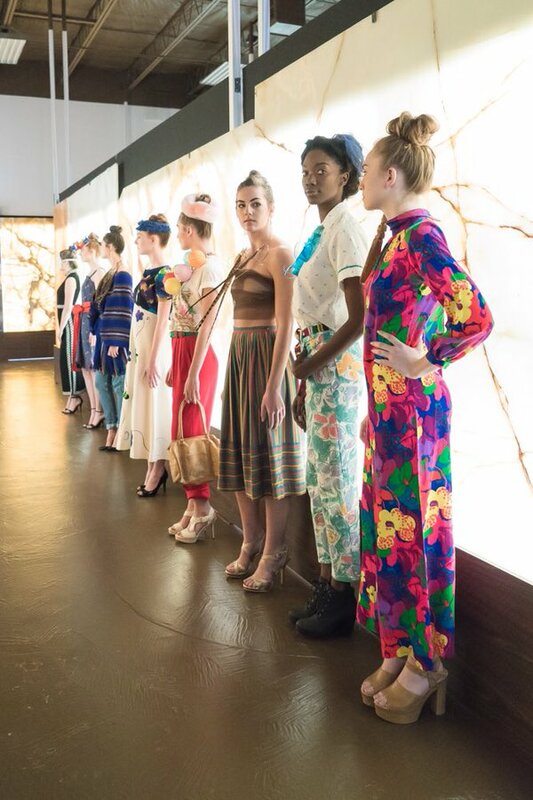 Kaleidoscope Houston concluded with Imaginarium- held at the very cool Vivaldi Stone Boutique. Wikipedia defines imaginarium as a reference “to a place devoted to the imagination. There are various types of imaginaria- centers largely devoted to stimulating and cultivating the imagination, towards scientific, artistic, commercial, recreational, or spiritual ends.” The event was exactly that… a destination into one’s imagination. The artists that showcased that evening (including myself) helped transform the showroom into a inspiring showcase. The art gallery-esque lighted stone sample walls created a unique backdrop for the runway. Shawn Flowers and Yung Chris HK (founder of Son Kiss’d) were the fabulous hosts of the evening. Now, because I spend the good first half of the show behind-the-scenes, I wasn’t able to see most of the performances, which included: Fenyx Aerial, Stella Marie Manalo– (whose voice I heard during rehearsal, and the girl can SING! ); Toki Singh and Son Kiss’d. I showcased a curated vintage collection with pieces from my shop- Lone Star Vintage. I also included accessories that I have made throughout the years. It was a great experience for me to showcase my talent to the large audience. Local bridal designer Natalie Harris of Damsel White Label had a low-key presentation, that of which I wasn’t able to fully see. However, I was able to catch a glimpse of the designer with two of her models after the program. She was showcasing select gowns, one of which is one of my faves. To the unforeseen eye, it’s a gorgeous white wedding gown, BUT if you look closely under the white overlay, you can see a beautiful print of a Texas bluebonnet field. The prints are basically why I’m going to get my (eventual) wedding dress done by her. Harris likes to incorporate edgy and memorable details into the gowns, thus giving the bride-to-be a non-traditional approach to her beautiful day. The last half of the evening (and the half that I was able to watch) continued with the debut of Of Myth + Muse’s first collection. The brand’s designer- Em Natalicchio also collaborated with Elyse Herman of Bark & Beam, a brand that does bohemian flower and crystal crowns. Natalicchio’s designs were feminine and romantic. I loved the black leather romper with lace top, the bralettes and skirts.The Of Myth + Muse website is live, however the collection will not be available until spring. I want to thank Pamela of Ubertina Productions for putting on this amazing event where local artists and creatives can come together and do amazing things. I also want to thank the entire Kaleidoscope team- you guys worked extremely hard and rocked it! Let’s see what Kaleidoscope Houston 2017 brings!